Sometimes one exceptional performance is all you need to make a film shine. Even the dullest script and most mundane direction can be pushed aside if there's just one person in that film that brings immeasurable life to it. Fences, directed by Denzel Washington, doesn't just give us one masterful performance - it gives us two. Washington's feature, adapted from August Wilson's play of the same name, isn't a perfect film, but when it focuses on its biggest and best assets, it's more than capable of making a handful of perfect moments. Troy Maxson (Denzel Washington) is a waste collector who lives with his wife Rose (Viola Davis) and their son Cory (Jovan Adepo). They are frequently visited by Troy's best friend Jim (Stephen Henderson), Troy's brother Gabriel (Mykelti Williamson) and Troy's son from a previous relationship Lyons (Russell Hornsby). Almost all of the film takes place in and around the Maxson household as Troy begins the process of building a fence around their garden, and as the family attempt to navigate societal issues as well as the problems they create themselves within their own home. 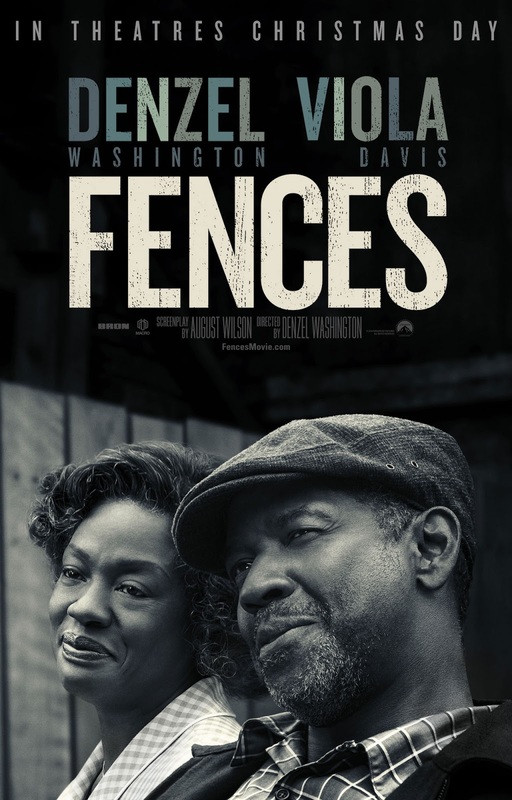 Fences could not work if its characterisation was off key. It's a film that is immediately noticeable as a play adaptation - the camera is mostly static and the film scarcely leaves the house - and if these characters failed to resonate then this would be a pretty dreary two hours. As it is, it's still a pretty dreary two hours, but Fences' works. Its characterisation is mostly pinpoint accurate, its dialogue is frequently exhilarating and its two lead performances are jaw dropping. Troy and Rose are compelling characters from the offset. Troy initially comes across as a funny, friendly person and you're immediately drawn to him through his stories and his way of seeing the world - he believes he escaped death by beating the Grim Reaper in a fist fight years before the events of the film. Rose instantly lands as a warm and kind soul, supportive of her family and those around her but strong enough to make her voice heard within a room of men. We feel we know them right from the film's excellent opening scene, a verbal overflow on behalf of Troy that is handled excellently by Washington but also works to define the people around him. The brief interludes from Rose and Jim and Gabriel add depth to the scene itself all while creating characters that feel fully fleshed out already. But then, Fences shifts gear. It takes this warm, fun opening scene and slowly twists it into something darker and more aggressive. This enjoyable atmosphere the film worked so hard to make is shattered, and the Maxson house becomes a place of vindictiveness and hostility. It's an ingenious move, and both Washington's direction and Wilson's script handle it effortlessly. The fact that the film manages to pull this off a second time is extraordinary - once more, it turns their home back into a pleasant environment and then slowly transitions it into the opposite. The film's atmospheric work is outstanding, it has a greater control of tone and mood than anything I've seen in years. Once the film transitions into darker territory for the third time though, there's no going back. Washington has been the one to watch for the film thus far, but after one genuinely shocking reveal, Viola Davis claims the spotlight - and boy does she make it her own. The anger and the heartbreak that she demonstrates when she finally snaps is mesmerising. She captures a wealth of emotions all at once, and couples them all with the knowledge that this one revelation will change her life and her world forever. The way she drops six words, just six words - "Well I was standing with you" - and changes an entire story is beyond the English language in just how good she is here. This is a transcendental performance. 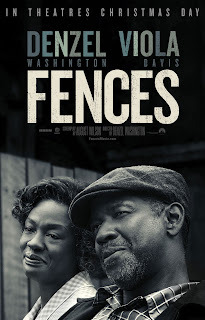 When you look away from the performances and the film's terrific tonal work, Fences fares less evenly. The storytelling approach is far from unique, and occasionally the moments between the stronger scenes start to drag. Whenever the film is spurting dialogue like a water fountain, things are great. But once it slows the dialogue down a bit Washington's directorial confidence starts to wobble. At 140 minutes, it can also feel over long. After the film blows you away with that Viola Davis scene, it struggles to recapture the power and force of all that came before. While it admittedly claws back some emotion for its final sequence, the act two turning point is just so big that the third act can't help but pale in comparison. 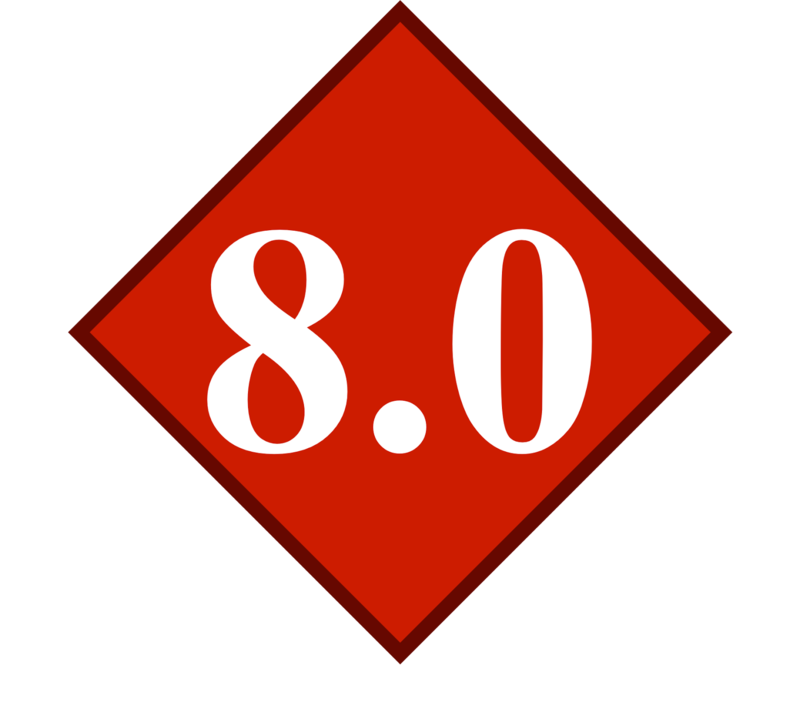 It pushes its characters into new places, but they're inherently less interesting. The way Fences tackles what it means to be a black man in 1950's America is also notable. While the supporting characters are perhaps less fleshed out in this regard, Troy's belief that he missed out on the Major League Baseball team is telling in a number of ways. Rose is confident that his age was the issue, but Troy refuses to believe it was anything but his skin colour that lost him the position. It sells Rose as a woman, in the same society, who is perhaps willing to look past racial prejudice and find an ulterior reason, while Troy refuses to acknowledge anything but racial prejudice. The conflict of interest is nicely handled, never overplayed nor under discussed. It refuses to ignore the issues of the time, but never lets its characters be defined by them. When Fences is on form, it soars. The magnitude of the performances here are worth the admission price alone, and the film's script finds people who have stories worth telling and just sits there and lets them tell them. It's hardly groundbreaking, and it's mostly all been done before, but it's still a powerful showcase for all involved. Come for the intriguing characters, stay for, well, Viola Davis. Its final act may fail to recapture the successes of all that came before, but Fences hits extraordinary heights with its masterful atmospheric work and a heart stopping performance from Viola Davis.